Whether you want to be able to connect remotely to your corporate network or to construct a virtual network between two remote points, through an unsecure network (eg: Internet), you will somehow need a VPN (Virtual Private Network). A VPN allows you to securely connect to a remote LAN (Local Area Network) through Internet or untrusted networks. SoftEther is an Open Source VPN Server, an alternative to OpenVPN. It's thought to be the world's most powerful and easy-to-user multi-protocol VPN software. Our article concerns how to setup SoftEther on Ubuntu Xenial Xerus Linux. Note that binaries used for this article are x64 architectures. If your machine is not x64, you need to choose the suitable binaries. After successful decompression, we find a folder named vpnserver in our current directory. Let’s do better by configuring it as a daemon. 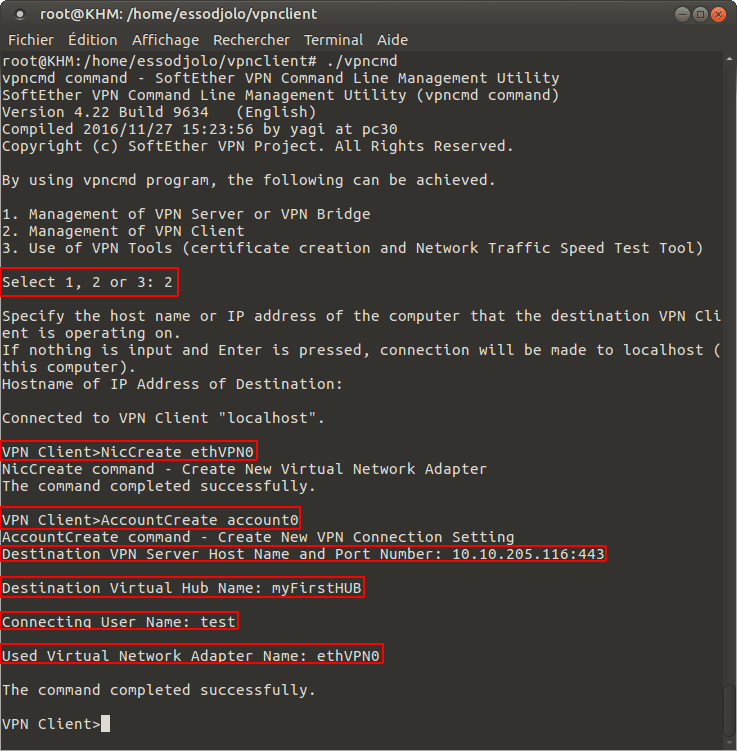 Let's follow these steps to configure our vpn server as a daemon. Before going further, let’s check that the vpn server can operate normally on our server. 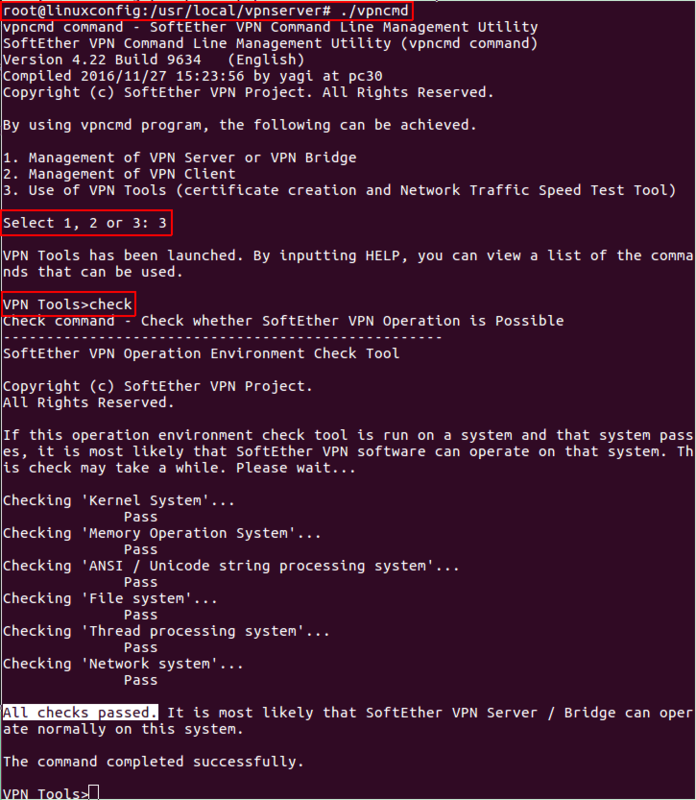 It is important to make this check before starting vpnserver. If everything is well done, we should get “All checks passed” message at the end of the operation. Now the VPN server starts automatically on boot, and we are able to manage the vpnserver using systemctl. SoftEther offers many use cases: Ad-hoc VPN, Remote access to LAN, LAN to LAN bridge, etc. In this article, we are configuring it for “Remote access to LAN” use. We will first create a virtual hub, and then make a kind of link between that virtual hub and the server network (the corporate LAN). As shown in the above picture, we select 1 for “Management of VPN Server or VPN Bridge”, then just press Enter for the following questions until we get VPN Server> prompt. At the command prompt, we type ServerPasswordSet. In order to allow clients to reach the server network, we need to link the virtual hub to the LAN. This can be done using a Local Bridge connection or using the SecureNAT function. In our case, the SecureNAT function will be used. SecureNAT function allows to use the VPN server as Simple Network Gateway, DHCP Server, or Simple Gateway to Remotely Access Remote Sites. 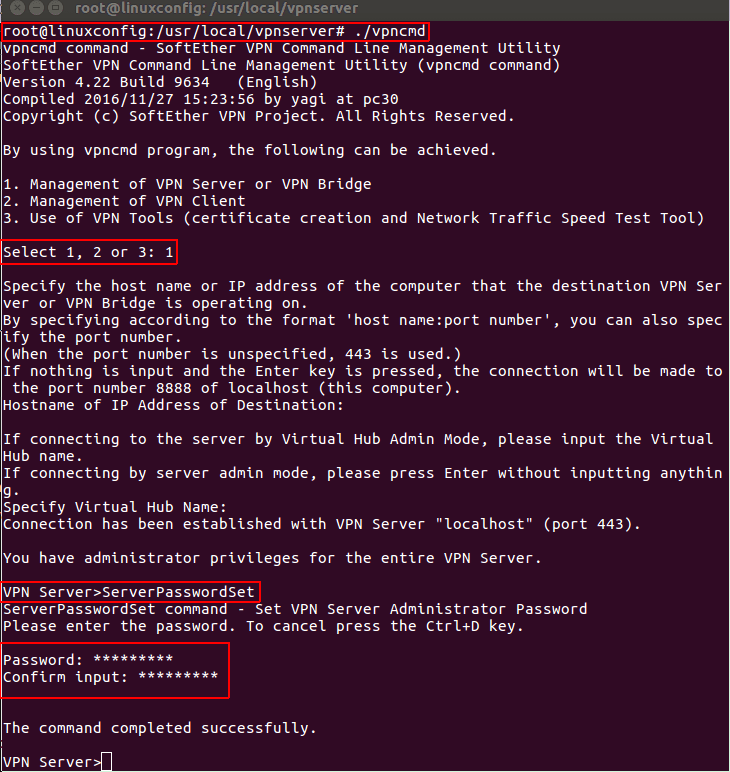 Let's select our virtual hub and enable SecureNAT function. After user's creation, we need to set a password. Note that it's possible to use other methods of authentication: NTLM, RADIUS, etc. The default authentication method is “password”. SoftEther provides clients for many OS including Linux. We will use wget command to download the client. The client compilation is similar to the server. Now we can start the VPN client and make the required configuration to connect to the server. Now we can launch the VPN client connection. 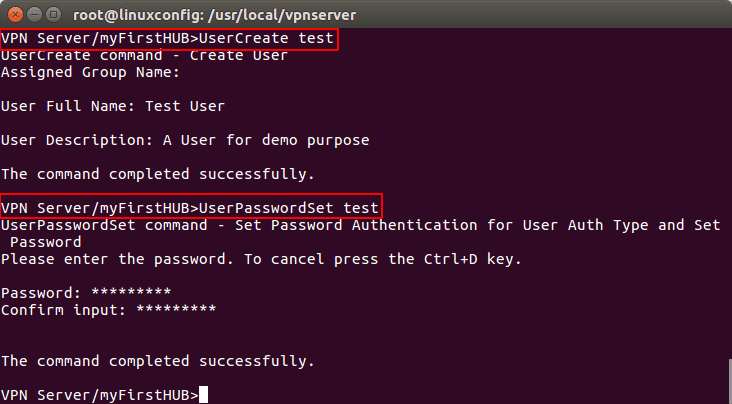 Before doing so, we have to specify the password for the user we have previously configured in the VPN connection. The client is now connected but no ip address is assigned to the virtual adapter. As last step, we need to request an IP address from the vpn server. We can use ifconfig command to find the vpn virtual adapter (prefixed by vpn_) and then use dhclient command to request an IP address. After this command, the VPN client will get an ip address from the SoftEther VPN server and can communicate with the remote LAN. Thanks for your interest in this article. We appreciate your questions and improvements.